White is the common color of gutters around the United States. Gutters are used to help catch the water running off of the roof, along with other debris like leaves and sticks from surrounding trees. Gutters should be cleaned at least twice a year to avoid clogged downspouts and mildew. White gutters that have mold or mildew growing on them need to be cleaned with a bit of bleach to restore the white color and make them shine. Set the ladder up against the house under the gutters. 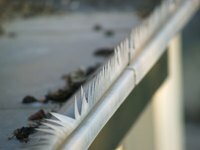 If you place the ladder on the gutters, you can cause damage to the gutters. Carry the bucket up the ladder with you and put on the rubber gloves. Clean out the gutters of all debris. Dispose of the debris in the compost pile or in a large trash bag and place outside next to your outside trash cans. Rinse out the gutters with the garden hose. This will push all loose debris out of the way and expose the stains and mildew that need to be cleaned from your gutters. Climb down the ladder. Mix 1 gallon of warm water with ½ cup of mild dish detergent and 2 cups of chlorine bleach. Pour the solution into the pressure washer. Climb back up the ladder. Pressure wash the gutters on a low pressure setting. Allow 10 minutes for the solution to penetrate the stains and then scrub them away with a stiff-bristled brush. Rinse out the gutters with the garden hose. Allow the gutters to air-dry. Chlorine bleach is toxic; do not inhale, ingest or make contact with your eyes. Flush with water if any of these situations occur.